You are here: Home » Relationships » The ABC’s of R.E.S.P.E.C.T. “You can only have it once you have given it. Lately the question of respect has morphed into, how can someone honestly, truly respect you if you don’t respect yourself? I believe respect should at most start within each of us…. You would think that after raising 3 children I would be the veteran of momhood. You would think that after all I have endured in learning my children at every age and stage of their lives so far I would have nothing left to learn except how to co-exist. You would think that when they hit the magic government age of 18 that says, “Hey, welcome to adulthood, but not really”, that I would be able to transition with them from apron strings and purse strings to I’ll-take-care-of-it-mom strings and no more routine bedtime strings. Yup. You would think all of these things because after all, I’ve been with them since the moment they were conceived. Alas, not even close. I’m learning, what I think is the biggest lesson of my whole life, other than not to be afraid of death, and that is the word and meaning of respect in all its Technicolor dreaminess. 3- the quality or state of being esteemed. In the case of our first definition I think I did an admirable job of showing respect to my children and their needs such as food, attention, time, education outside of school and moral support whether asked for or not. Just to name a few. In definition number 2 when the kids did something that went above and beyond their basic level of earned respect, and by that I mean getting homework done well and on time, helping with chores, not arguing when an extended family visit was in order, I made sure they understood why I was calling attention to my “extra” respect. I’m a huge fan of answering those “why” questions. In definition number 3 I always tried to find reasons to celebrate them. I never enjoyed keeping to the “traditions only” rules of celebrations. For example I always enjoyed celebrating their ½ birthdays. I would serve them dinner on half a plate, I would buy a silly, non-essential gift and not wrap it or give them the first ½ of a gift and then the rest on their actual birthday, I would give them ½ a glass of a beverage, I would even supply half a cake without anything written on it and sing very badly a half version of the birthday song. They thought it was cool and funny but I really just wanted them to know how aware I was of them and their lives. 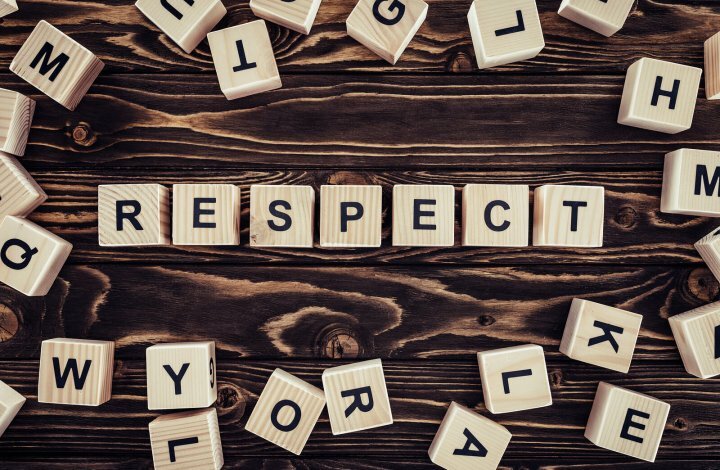 Now, a mom would think that after a lifetime of showing them how to be respectful, what respect looks like and sounds like and feels like, that they would automatically have it in them by 18 years old to have respect as part of their DNA. What I am learning very painfully is that I did so much respecting of them that I never stopped to fully show them how to respect themselves or me. On some basic level I did teach them self-respect like bathing, teeth brushing, care of clothing, and the importance of a thank you whether in note form or verbal but it wasn’t enough. I did teach them to stand up for themselves but it seems not very well. We all have demons living inside of us that talk trash to us about how we are not good enough, not pretty enough, not worthy enough, not talented enough. Some of us are able to outgrow those little annoying negative voices and some of us are slaves to those voices. So, here I am dealing with all that I hid from myself and unknowingly did not deal with when it came to my children about how to first and foremost respect myself from the inside out. The most powerful lesson is that even when your children grow up there will always be ways to parent them. The job changes and evolves but the investment never ends. Words, actions, emotions live on long after our bodies do. I’ve learned an important lesson when it comes to integrity of self and of others. My youngest is going through a very lost, very confusing time in his life and his inner demons are being played out in glorious fashion. His very low self-respect is causing our whole family to want to hide away from all of his negativity but we can’t and more importantly we won’t, regardless of how we feel. His low self-respect shows up in ways such as guilt, blame, lying, secrets, volatile emotions and stress. His body is not responding well to all of his low self-respect and so it is becoming very dangerous for him to continue on this path and that is not healthy for him or for any of us who care and love him so much. I am forced to see so much of my own insecurities and lack of self-respect showing up in him and I feel at times helpless to empower him and hypocritical to try. But here’s the thing, and it really matters right this moment, we are going through the same thing at the same time and I just might be able to help him and he help me. What wouldn’t a parent do to save their child? If I were to draw a picture of self-respect it would look like flowers blossoming with hope and integrity in the early cool, spring air. It would look like my boys did when they were young and wanted to wear super hero costumes because that is how they saw themselves that day. It would look like girls in high school who wear real clothes when everyone else is wearing pajama pants and slippers to class. It would look like teenagers laughing out loud at something funny their parent said and they didn’t care who saw or heard them laughing. What does self-respect feel like? Self-respect feels like warmth. Self-respect feels like having that superhero living inside of me, All. The. Time. Self- respect feels like knowledge, wisdom, confidence and courage all wrapped into one amazing 6th sense. Self-respect feels like being small in stature on the outside but feeling 6’ tall on the inside and letting the inside out. Self-respect feels like being good enough, worthy enough and just enough. You’ve heard me say it over and over, perspective is everything. What you concentrate on most is what your life will bring to you. If your perspective is negative about yourself then everything you see from your point of view will have undertones of negativity and hopelessness. If you change just one aspect of your point of view from negative to positive then you are creating a crack in the negative to let the happy, positive light in. I poured all of me into being a mom and took little to no time out for self-development. In that vein I simultaneously showed my children that being an adult meant giving up on all your personal individual rights and being only for someone else. No wonder my son is having a hard time growing into his manhood/adulthood. It sounds like I’m putting an awful lot of responsibility on my shoulders for who they have become so far and not enough responsibility on theirs and maybe I am, however, I feel blessed in the fact that I can see these characteristics so clearly now and hopefully say something and do something and then back up what I say and do in my own life’s example so that he doesn’t continue to believe that he will have to lose himself completely. So how can I build self-respect and pass on those building lessons to my children? Understand that self-respect is a close, very close cousin to self-confidence and self-esteem. Each can stand alone if necessary but they all work better together. Believe every day in my own authenticity. Always stay in touch with my truth and my inner child. The child that day dreams, plans, schemes and loves to show her individuality. My truth showing up in the confidence of the decisions and choices I make, even if my decisions and choices are not in line with someone else’s. Somewhere in our teens we get it our heads that we equally want to be seen for our individual selves while blending in to the social norms so we don’t look “foolish”. We can’t have it both ways. It will always be more fashionable to choose ourselves over being a clone of someone else. Know my character strengths, know myself. Character strengths are the building blocks to who I want to be and been seen as; what I believe about myself without a doubt. These strengths allow me to develop my own core standards of living and the talents I can use to actually make that life happen. These strengths allow me to handle criticism with a growth mindset instead of persecution mindset, they allow me to see beauty and excellence in all things, and they allow me to work on values that are not so strong yet because I have a growing understanding of all the possibilities that live inside of me. Dress to impress……ME. Treat me as I would treat a stranger or anyone I love. If wearing nice clothes helps me feel good about me then I need to make sure I wear nice clothes. How many times did I tell my children, the boys mostly, that when you dress to learn you will learn because you feel good about your appearance. Feeling good makes you stand taller and talk more and interact more and take responsibility more. When you dress to be slouchy and comfortable you will be lazy in all things. Besides that little nugget it’s so fun to wear clothes that look nice. When you look nice you feel nice and then you act nice. Best foot forward. This goes beyond what I wear. This speaks to my reputation and integrity. Stay true to who I am and who I believe I am. I may falter from time to time, my ideas may not work out the way I planned but I will always try to pick myself up again each time I fall and that is what people will know for sure about me. If I lose respect for me how can anyone keep respect for me? Give what I want to get. If I want to have friends, I need to be a friend. If I want people to support me then I have to be supportive of others. If I want respect then I need to show respect, always. Let bad feelings come and then promise to let them go. Don’t let bad feelings about me linger too long. It takes no time at all to fall down and stay down. Don’t become dependent on the praise from other people. Sure it’s a great feeling to get those “atta girl” accolades but with all my heart try not to depend on the approval from others. Be confident enough within me to know for sure that I did a great job even if no one took notice. I hope this list of lessons will help you on your journey through self-respect. Need some help? Write to me and I’ll be your helper.